Our new Laughs and Scarves exercise class at the Searchlight Centre on Kingston Road in New Malden is proving very popular, especially with members of local learning disability charity Kingston Mencap, which is based at the centre. 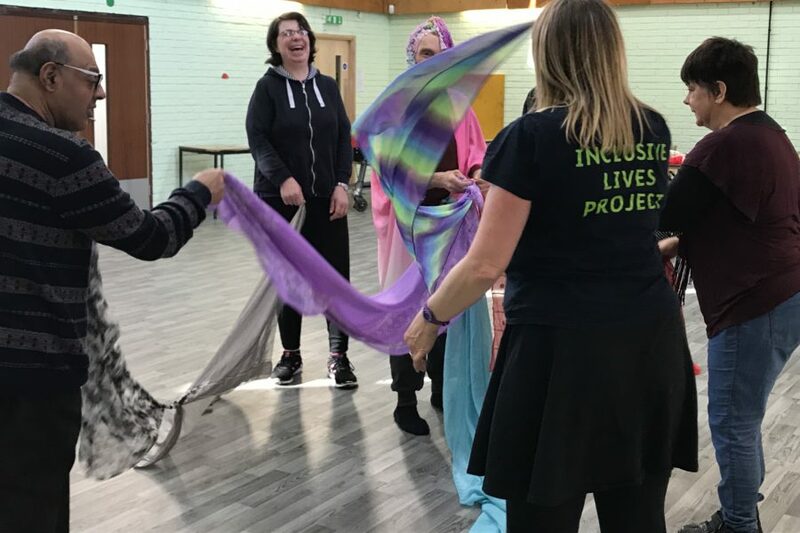 Laughs and Scarves is a relaxed group fitness class, set to toe-tapping music and part of our Inclusive Lives project. Instructor Nicola makes sure everyone feels the beat as they use scarves and instruments to move and stretch along to the music. In fact, everyone is so busy having fun with the scarves and instruments, they don’t realise just how good for them the class is! They are breathing, raising their heart beat, working muscles and stretching, plus of course warming up and cooling down. But it’s not only the physical benefits that people enjoy – fun exercise like this is a great mood booster! Ideal for those people who feel low, anxious or isolated. The newly refurbished Searchlight Centre is the perfect venue for a health and wellbeing class like this, as there is lots of space in the big hall and excellent facilities. Plus there is limited free parking. As our sessions are part of a Big Lottery funded project, they are free to those who attend. Part of our mission as a YMCA is to ensure that every person should fulfil their potential and enjoy the benefits of good health and wellbeing. So if you, or someone you know, would benefit from an exercise session like this, why not give us a call on 07932 265582 and speak to Co-ordinator Tracy Ryan.